Join us for a special in-gallery conversation between artist Mariana Castillo Deball and Fordham University Professor Barbara Mundy on “Finding Oneself Outside,” Castillo Deball’s first solo exhibition in New York City. Dr Mundy is an art historian specializing in Latin American art and indigenous cartography of the sixteenth century, while Castillo Deball’s artistic practice regularly engages specific historical modes of the production and exchange of knowledge, including maps, iconography, and cosmological forms. 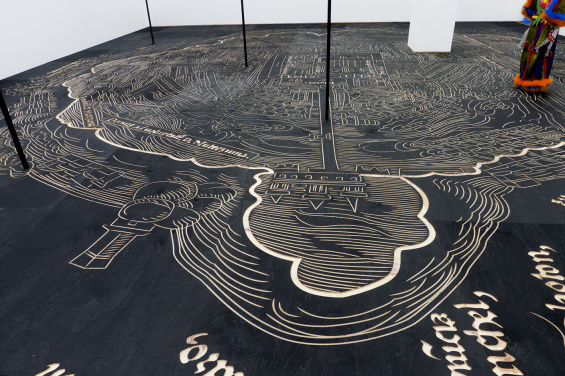 Professor Mundy’s intricate understanding of the map of San Pedro Teozacoalco (c. 1580) will help to guide and contextualize the conversation about Castillo Deball’s large-scale inlaid wood floor installation, Teozacoalco Map (2019), which draws directly from the early European colonial and Mixtec visual traditions of the sixteenth century. Together, they will discuss the legacies of colonial cartography and codices in Central America and the ways in which Castillo Deball’s practice deliberately engages with academic and archaeological research to make visible the institutional structures and complicated temporal paths involved in constructing and disseminating knowledge about cultural histories. Generous ongoing support is provided by the Charlotte and Bill Ford Artist Talks Fund. Full support for “Mariana Castillo Deball: Finding Oneself Outside” can be viewed here.